NASA’s Space Station Live! website and mobile app users can tour a virtual recreation of NASA's Mission Control Center and access live data from the space station on the consoles. Ever wonder what the crew on board the International Space Station is doing right now? Or what is the temperature of each of the orbiting outpost's modules? Or how much power is being generated at this very instant by the space station's solar array wings? On the website and through the mobile apps, users can navigate through a realistic 3-D recreation of the space station's flight control room in Houston. 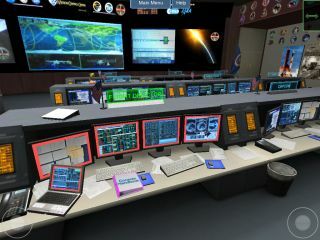 They can navigate through the rows of consoles, selecting workstations such as the Flight Director's or Capcom's (spacecraft communicator) to see the type of live data they work with. NASA realized that sharing similar access to some of that same live data could help raise public awareness of the "groundbreaking research and technology development work ... going on every day in the microgravity environment of space."